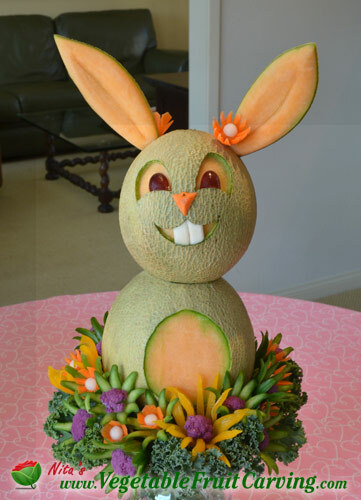 This year we hosted a family Easter party complete with carved fruit and veggie Easter Centerpieces. 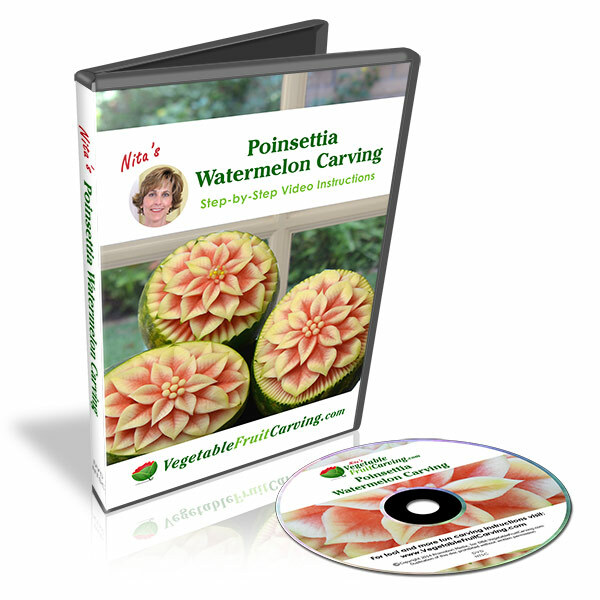 In this post I’ll share some of the fun we had and the carvings I made. You’ll see photos of my Easter Centerpieces and you can see a video of the highlights of our family Easter party. This Easter, we had a larger than usual turn out. And, we had a super busy week leading up to the party before we even began on all we needed to do for the party. My husband and I had a lot of preparation to do. You know, the usual stuff when getting ready for a large party – shop, clean, prep the yard, rent the bounce house, dig all the Easter baskets and Easter decorations out of the garage, drag out the tables and set up the chairs, put up the balloons, flowers, etc. Not to mention preparing some of the food. We did a potluck style so we had a help in that area. My husband even made one of his super strong pinatas. He called it King Bunny. 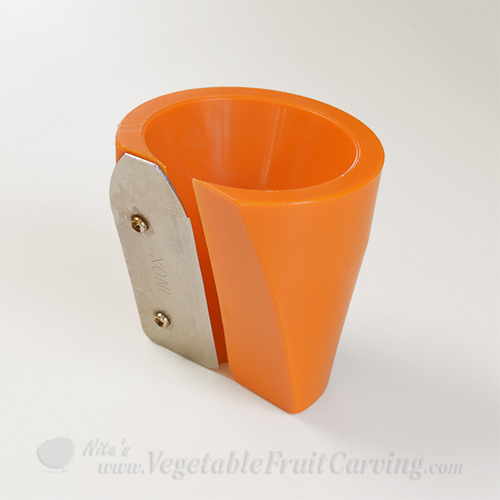 With all of the time it took to get the party ready, I was limited in the time I had to carve a fruit centerpiece. So, I decided to go with something simple, fast and cute. Lots of children would be attending our party this year so I created a whimsical and happy bunny like the bunnies by Chef Jean Silva that I published on my blog earlier. Sometimes you want to to create something showy and sometimes something simple is best. I made this bunny look like a girl by putting some carrot flowers up by her ears. 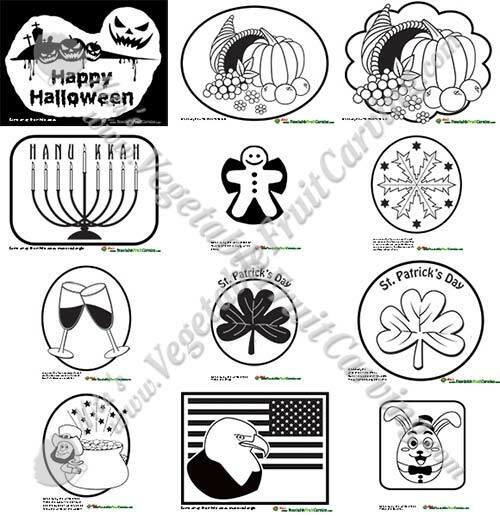 Her eyes are red grapes, her nose is carved carrot and her teeth are carved from a turnip. 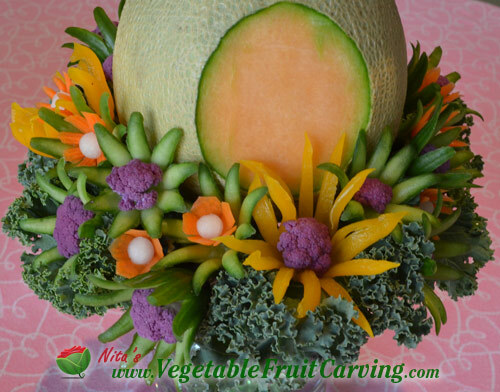 The green flowers at the base of the centerpiece are made from baby cucumbers. The purple centers are purple cauliflower. I love the color. It caught my eye in the store because it was so vibrant. The yellow flowers are mini bell peppers. 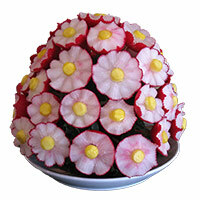 The small orange flowers are carved from carrots and the white centers are made from turnip using a mini-melon baller. The flowers were tucked into a bed of curly kale. I like my Easter bunny’s happy face. My cantaloupe Easter bunny was a very tiny part of the party but you can see it in the center of the table getting swarmed by hungry guests in the short section of video. I also played with making a few hatching chicks from yellow squash. I put them inside broken eggs and added carrot beaks and glass eyes. The nest was made from shredded cabbage that I tucked into a show cabbage leaf set in a hollowed out cantaloupe half. 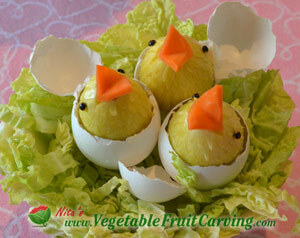 Susan Belden’s birds, that I published in a blog article before Easter, inspired my idea to make these chicks. 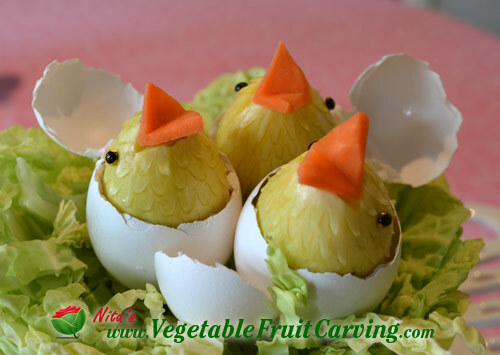 Hatching chicks made from baby yellow squash with carrot beaks and glass eyes. I used small U-V cutters to create the “feathers” on these little chicks. You can get the U_V tools for creating “feathers” by clicking this photo. 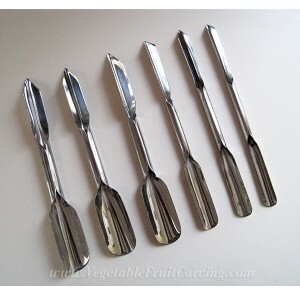 It will take you to the item in our online shop. The Easter Centerpieces were just a tiny part of our party. If you are curious about our Easter party, you can see the highlights in this very amateur home video I shot. You’ll see the fun but you won’t see me at all in this video. It’s 5 hours of party condensed to 16 minutes. If you have time to watch it, it may make you smile. Fortunately we were blessed with a perfect day. Rain had been forecast but we ended up with a warm sunny day that didn’t turn grey until near the end of our party. We had the traditional Easter egg hunt. We had Karaoke hosted by my sister-in-law. The kids had fun with the bounce house that we rented. There was food of course, lots of desserts and a pinata. After that the karaoke continued for a while as the party wound down. Out youngest guest was our 16 month old niece and the oldest was my 94 year old mother-in-law who you can see singing Pasty Klien’s song “Crazy” in the video. From the youngest to the oldest, a good time was had by all. Our Easter party reminded me of how blessed I am to have wonderful family and friends. I’m so grateful. I hope my Easter centerpieces give you some ideas for your next spring time party where you can enjoy the company of your loved ones. 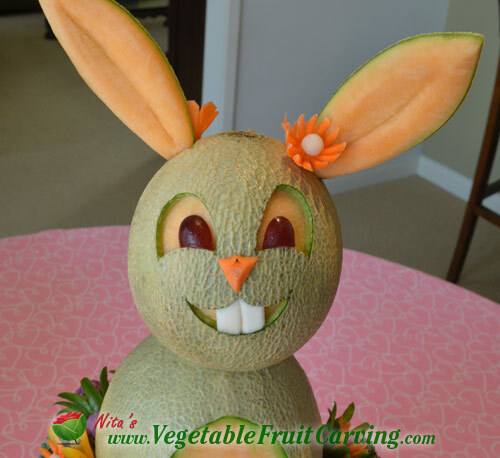 Love your cantalope bunny. I’m in awe to have so many people at your home. What fun and memories were made and share I’m sure. Thanks for sharing with us all. I have asked this question before and not received a response. Does Nita offer classes for beginners? Our online lessons are even better than live beacause you can learn at your own location (no travel necessary), at your own convenience, and at your own pace. And you can always go back to refresh your skills at any time in the future.